Greetings friends! It's a beautiful day. I hope you are enjoying some sunshine where you are. My question for today is: Aside from blogging, do you have a hobby? 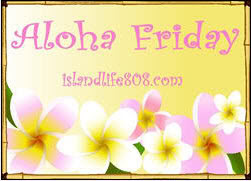 For more Aloha Friday fun visit An Island Life. Before you go, enter my giveaway for a What to Expect the Second Year prize pack worth over $120! I don't have many entries, so there's a great chance you'll win! Ohhh boy, I have MANY hobbies. I sew, bake, cake decorate, write, blog, read, make cards, scrapbook, web design, those are just a few of my hobbies! Does participating in incentivized surveys count? That's my latest obsession! My hobby use to be riding my dirtbike and yesterday I was talking to an old friend about it. For some reason, it seemed to slip away, but this riding season, I will be back! I used to have some...not sure what they are anymore. Now it's just family and family and blogging. I'll take up sewing again.